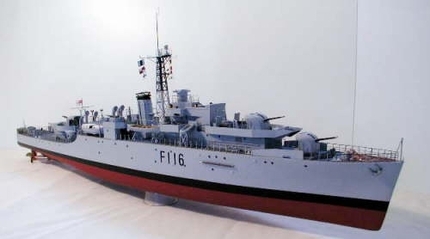 This modified Black Swan class frigate was launched on 7th May 1943 at the yard of Alex Stephens & Co, Linthouse. After a very active wartime career "Amethyst" was sent to the Far East as a guard ship for the British community in Shanghai. The action that made her a household name was an incident in the Yangse river in late 1949 where she was trapped almost 200 miles inland. In a heroic action she broke out and escaped to the sea. Amethyst was sold for scrapping at the Plymouth yard of Demmelweek and Reading. Members of the Amethyst association still meet at regular intervals. The fibreglass hull in this is with full plating and port detail. Computer generated colour coded printed plastic forms the main superstructure along with the 1mm plastic deck. To complete the construction of the model all complex parts are vacformed in 1mm plastic for funnel, boats, turrets etc. A complete set of fittings is included in the kit with all detail parts such as weapons, deck fittings, etc, cast in light alloy. Larger item such as lockers, floats, and gun bases are moulded as resine castings for light weight. The lattice mast, such a notable feature of this class of ship is assembled from etched brass in four parts for simple assembly. Ladders and stanchions are also in etched brass to give a final showcase finish. Propshafts in stainless steel are cased in brass proptubes with fitted oilers and replacable bearings along with rudder and tiller arm. These, together with a comprehensive instruction book with digital prited picture / instructions and a FULL SIZE PLAN assist in the assembly of this impressive model. One or our oldest kits and still a very popular ship. This kit has now been reworked and brought up to date of the standards of the latest kits. Glass fibre plated hull, brass etching for fine detail, up to date instructions and a C/d available with all the construction pictures of the prototype models.